This is the first of (I hope) many family portraits. This man achieved some fame, but most of our relatives did not. My hope is that it humanizes those dry names and dates that cause such eye-rolling when ‘genealogy’ is mentioned at family gatherings. There are many Thomas Duncans in our family. 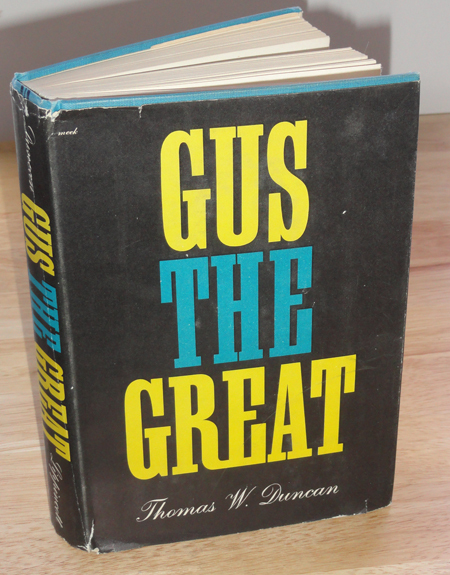 The one I want to describe today is Thomas William Duncan born in 1905 in Iowa and known to the world as the author of the best seller Gus The Great published in 1947. The Book-of-the-Month Club made it the September 1947 selection. Heady stuff! Hollywood showed some interest, but there is no record of a movie having been made. Just to fit this Thomas into the family – he’s the son of Irene and William Thomas Duncan and he’s the great grandson of Thomas and Eliza Duncan, our immigrant Scottish ancestors. He is also Harriet Duncan Claycomb’s second cousin, but I think she didn’t know him. I never heard his story from her. I read the book just because it was written by one of our Duncans, and found it charming. The characters are well developed and authentic. Gus is a newspaperman (as his creator was once) who longs to have a circus. The Time Magazine review at the time said, “As a literary performance, Gus the Great is frequently slick, gaggy and sentimental. But it has a kind of animal vigor about it and it is never dull.” I still recommend it! The author, it seems, is not so easy to define. He published articles for newspapers and magazines in his teens. He started college at Drake in pre-law, transferred and graduated from Harvard majoring in writing, then returned to Drake for his Masters. Staying in Iowa for a while, he taught at Grinnell College. His summers spent with Chautauqua theater groups showed in his novel O Chautauqua. He wrote a circus novel before his best-seller called Ring Horse, but it wasn’t as popular. During the 10 years it took to write Gus the Great, Thomas and his wife, Actea, were nearly broke. They roamed around the southwest living in a trailer. 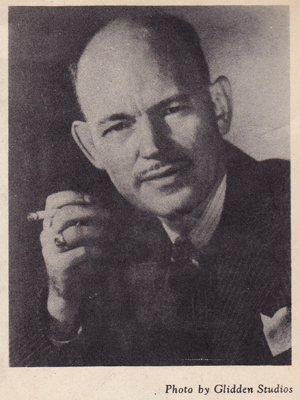 When Lippincott published Gus, Thomas Duncan earned $250,000 in royalties. It’s reported that his first purchase was a new Chrysler convertible. To his credit, he also funded a library in his hometown in memory of his father. Thomas published other novels into the 60s, but none had the appeal of Gus. It seems the money did not last forever. Thomas Duncan died in 1987 in Las Cruces, New Mexico. Actea died three years later penniless. They are buried in unmarked graves. This entry was posted in Family Stories and tagged best seller, book of the month, circus, Drake, genealogy, Grinnell, Gus the Great, Harvard, las cruces, New Mexico, Thomas W. Duncan. Bookmark the permalink. Well, he did live to be 82, was a dreamer and roamed the beautiful SW in a great era with an attractive woman and in a trailer. What stories he could tell us. The Magazine photo is magical. I hope he lived an adventurous, healthy life and died peacefully. At least they enjoyed all their money. Kind of odd about having unmarked graves. Thanks for sharing, Donna. I feel the same way – they lived full lives. He wrote a best seller – more than most of us do! And yet the unmarked graves bother me. Better to be scattered to the winds! Thanks for visiting. I did find the graves in Las Cruces – about an hour from me. It seems the Masons there often make space in their cemetery for ‘paupers’. Otherwise I would never have found them! I grew up in Casey Iowa. Thought about Tom a lot in my early years. Wish I could write but could only make money. Tom did better than me. Any chance you are near New Mexico? A man from Colorado was so impressed with one of Tom Duncan’s books (The Sky and Tomorrow) that he now is paying to place markers on their graves (Tom and Actea’s) in Las Cruces in a few weeks. It would be great if you could join us. Thanks. It seems we made the front page of the Sun-News! And for something very good. Gus is the Great American Novel. I had hoped in my retirement years to teach an American Lit class using Gus as my text. I knew that college bookstores wouldn’t be stocking it so I began to accumulate used copies. My retirement plan didn’t work out and so I started giving copies away- dozens of them- for the promise that the receiver would read the book. I replenish my stock from time to time and include with every one a printout on the story and characters that inspired the book. Gus Burgoyne was Fred Buchanan, who owned Yankee Robinson, World Bros and Robbins Bros (all railroad shows wintering in Granger, Iowa) and vanished from the Robbins lot in Mobile in 1931. He later was involved in the ownership of several truck circuses. Ive Pawpacker was William P Hall a circus broker who had his own circus on the road briefly but was mainly known among circus people as a dealer in second-hand circus equipment and animals- his establishment was in Lancaster, Missouri. Hall bankrolled the Robbins show when the going got rough and brought the show back to Lancaster when Buchanan went on the lam. One cannot read the first page without wanting to finish the book. I love this! I agree, once started this book must be finished. Thanks so much for your comment. There is a celebration of Thomas Duncan’s life planned for Casey, Iowa in 2019. Plan ahead. Donna: I feel terrible about Tom and Actea being down on their luck. I tried to track him down in the late seventies but ran up against a wall- neither his publisher nor an old friend of his in Arizona had any clue. I am seventy-eight and spend most of my time in a wheelchair, so I doubt if I can plan on the 2019 get-together. I worked for circuses for nine years when I was young and now collect circus memorabilia in my dotage; will attach a pic of me in my circus room- don’t know if it will go thru with this program. What kin are you to Mr Duncan? We have tried to find people who knew him here and haven’t had much luck. He is my mother’s second cousin, but they were not close. So he’s my second cousin once removed. I would love to know more about the 2019 celebration planned to honor Thomas W. Duncan. My husband and I visited Casey, IA in 1988 so I could see my mother’s birthplace. Like Dave (see below), I’m older now, and not likely to be able to travel, but I do want to stay informed. Alvena went on to marry William C. Von Bergen, who died young, leaving her with three little children to raise through the Depression. Interestingly, the seductive German music professor in The Sky and Tomorrow was also named Von Bergen. What fun Thomas must have had naming his characters and towns. Thank you, Donna, for this interesting blog, your photographs, your memories. Now I shall read more! This is wonderful! I don’t know a lot more about the 2019 celebration, but I will certainly post when I find out. It seems so far off! And with everyone’s help we seem to be piecing more of his life together. I think near the end, he had distanced himself from his family. I moved to New Mexico 12 years ago – I was so surprised to find out he had lived in this area. Please keep in touch. Thanks. I have lived in Casey most of my life. Casey’s 150th Celebration will be held July 12-14, 2019. I do hope to be there! Donna, you WILL be there! End of story! Okay, I’ll be there! Thanks Robert. What a joy to discover this story! My relative is the lovely and intelligent Actea (Young) Duncan, Thomas W. Duncan’s wife. 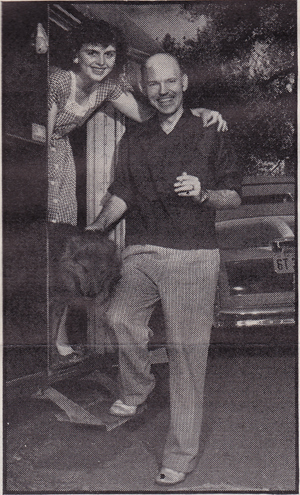 What a wonderful picture of her with her husband living in their trailer. She comes from a family that valued education and . She aettended Roosevelt High School (West High School) which was the school where the affluent and professionals sent the young people in Des Moines, Iowa. The family lived in a new area of the city where many professionals were settling at the time. Des Moines has been a major hub of the insurance industry. Her father worked in the actuarial department of an insurance company which required someone with a strong intellect in statistics. Actea’s mother was a school teacher for many years before she married and had children. Sadly she had no children so I’m wondering if this was a conscious decision for she and Tom so he could pursue his dreams. Sorry they ended up in poverty, but they seemed to have lived a magical life for many years and I am glad someone stepped forward and provided a marker for their burial. Constance, thank you so much for your comment. I’m thrilled to hear about Actea. I too love that photo. And doing these stories about them made me wish I had known both of them. Do you have any of her writings? Donna, and all: Here is a link to a blog you will find of interest! This is wonderful! Thanks so much. Mention is made here of a Masonic award. Do you know whether he studied Masonry? If so, that gives an interesting new (to me) slant on Tom Duncan’s writing. Actea is mentioned near the end. aha! ahb Actea’s books, mostly mystery novels, appear under the name Carolyn Young. I have a couple of books that I keep extra copies of – just to give away. It’s fun. Let me know his response.